How to make the template collection for using the templates online. We offer you two options. You can use both of them or just one option. Option one. Buy the template(s). Buy templates. As soon as you bought the templates they will be automatically added to your Online Template Collection and will be available in 'Use Templates Online' service. You also can download the template(s) on your computer after the payment received and use the digital template offline with any graghic tool that works with layers (Photoshop, GIMP, and so on). Very little graphic knowleges required. The step by step instructions could be found here How to use digital photo templates with Photoshop or GIMP. Option two. Buy Membership account. $9.95 per month. Use as many templates as you want. If you bought Membership account for one month almost ALL digital templates that you can find in the website template collection will be available for using online. You have to create your own online template collection. By creating your own collection you will not need to search every time for the particular template between hundreds templates you don't use. Please read below 'How to create my own online template collection'. You will not be able to download the templates from your online template collection on your computer. Also please be advised the digital templates that required 2 images to make a picture are not available for online using. (earrings, cufflinks, jewelry sets such as pendant plus earrings). We have a wide range of template styles like Bezel, Scrabble Tile Pendants, Bottle Cups, Glass Tile Pendants, Buttons, Magnets, etc. 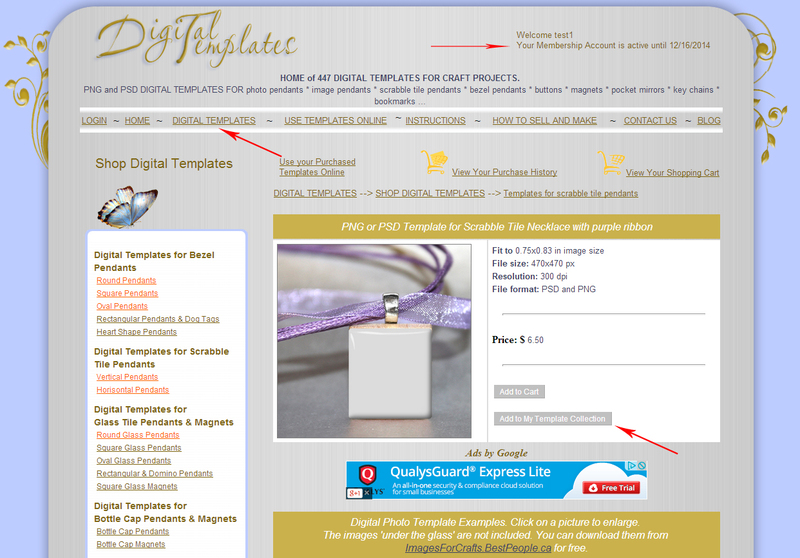 To make it easy for you to use our online service you should create your own online digital template collection. It's easy. Open Digital Templates , find the template you like, click the link 'See details' and on the template details page click the button 'Add to my collection'. That's it. The template will be added to your template list and will be available on ' Use templates online' page. Your template collection will be saved for you forever. If you decide do not use the website some time and buy membership account after 5 months (for example) you will have your digital template collection ready for you to use. You can add as many templates as you want. We don't subscribe you for membership account. You should control your payments by yourself. You will see the date on the right upper page corner when your membership account will expire.